The Panjab University Student Union (PUSU) today swept the Campus Students’ Council elections winning all four seats here. This is for the fourth year in a row that PUSU has been victorious in the student elections. However, last year they had managed to win just the posts of president and vice-presidents. Amandeep Singh from the Department of Law was elected president, Avneet Kaur from the Department of Psychology vice-president, Abhishek Puri from the Department of Chemistry general secretary and Karan Veer Singh from the Department of UIET to the post of joint secretary. Though the results were officially declared at 4 pm, the verdict was out much before i.e. around 2.30 pm. By 3 pm, supporters and students from PUSU danced their way to the Students’ Centre and started distributing sweets. Supporters continued to dance to the beats of “dhol” for another hour till the official announcement. Earlier in the day, 68.68 per cent polling was witnessed during the election. A total of 5,077 votes were cast of a total of 7,416. According to PU officials, a record polling was witnessed this year. According to Prof Nirmal Singh, DSW, this had been the best election ever conducted in his tenure. This was for the first time that student council elections were conducted on a Saturday. Soon after the results were formally declared and the winners were garlanded, the winning team took a round of girls’ hostels to thank them for their support. After the results were compiled, the executive members of the council were chosen. They are: Aditya Kumar, Paramdayal, Mandeep Singh and G. Singh. Earlier in the day, departmental representatives were also elected. Soon after they were elected at around 11.30 am, they gathered at the Students’ Centre and were made to wait for the result of the council elections. A total of 75 DRs were elected, 38 of whom were unanimously elected. The tension of final verdict was visible at the camps of various parties since early morning. Soon after the process of casting of ballots finished at 11 pm and counting started in each department today, results started filtering in at the camps of the different parties. The fight between PUSU and the SOPU-NSUI-SOI alliance remained neck and neck till around 1 pm. However, around 2 pm the picture became clear with PUSU taking the lead. Supporters soon started trickling in and waiting with bated breath for the final result. Unlike last year, the whole panel was in focus this time. Not wanting to take any chances this time — unlike last year when the PUSU panel took out a victory lap only to find out later that they had a split council, with two seats going to the other group — no drum beaters and flowers were visible. Celebrations began only after the news of their outright victory had been confirmed. Amandeep bagged the post of president by a margin of 307 votes, polling 2,102 votes. Staying close behind him was Dalveer Singh Goldy from the SOPU-NSUI-SOI alliance with a total of 1,795 votes. Vikas Rathee from the newly formed INSO polled 806 votes, while Bhuvan Azaad from the SFI polled 75 and Satender Dahiya from the ABVP-HSA alliance got 204 votes. Interestingly, Parminder Singh Brar and Gurveer Singh, covering candidates for the SOPU alliance, who were late in withdrawing their nominations too polled five and 10 votes, respectively. Avneet Kaur was elected vice-president by a margin of 871 votes. Close behind her was Gagandeep from the SOPU alliance with 1,459 votes. Chhavi Bhatia of the ABVP alliance got 325 votes, while Geetanjali of the INSO got 445 and Shital Sheokand of the SFI got 175 votes. Abhishek Puri won the post of general secretary by a margin of 1,117 votes, polling 2,202 votes. Gurinder Bawa of the SOPU alliance polled 1,085 votes, while Ravinder Singh Sheokand of the ABVP alliance got 761 votes, Vishal Kohli of the INSO got 713 and Sanjeev Kumar of the SFI got 109 votes. Karan Veer Singh won the post of joint secretary by a margin of 727 votes, getting a total of 1,907 votes. Guriqbal Singh of the SOPU alliance polled 1,180 votes. 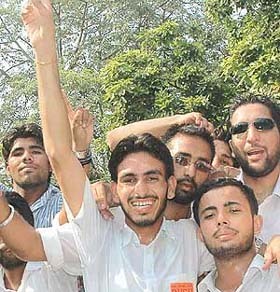 Amandeep Singh of the SFI polled 298 votes, while Anup Gupta from the ABVP alliance got 981 and V.K. Prasher of the INSO got 530 votes. The Panjab University Senate meeting slated for tomorrow is expected to be the most important one this year. The issues of appointment of the Registrar and Dean (University Instruction) are expected to witness heated discussions and also dominate the proceedings. The issue of the removal of the Evening Studies Chairperson will also figure at tomorrow’s meeting. Interestingly, all three cases have been presented in the High Court and thereby directed to be addressed in the Senate. Dr Sodhi Ram had served a legal notice on the university and demanded reconsideration of Syndicate’s appointment of Dr S.S. Bari on the grounds that he had no administrative experience. All records of his selection will be placed in front of the Senate. The court has also asked the Senate to take up the case of Evening Studies Department. According to the PU calendar, the Senate, on the recommendation of the syndicate, designates the Chairperson. The issue of appointment of Prof V.K. Bansal of the Department of Laws as the DUI before his retirement for a month, which is being challenged by Dr Veer Singh of the same department, is also on the agenda. Interestingly, regarding the same case, Dr Veer Singh today sent a fax to the office of the Vice-Chancellor, demanding to be immediately informed about the Senate’s decision on the appointment of the DUI. At the Guru Gobind Singh College for Women, Sector 26, nearly 750 students caste their votes. Three candidates were in the fray for the post of president, but Ekta Randhawa won the seat by a margin of 17 votes. Sumeet Anand was elected vice-president, Shailja joint secretary and Poonam was unanimously nominated as secretary. Meenakshi Tewari (701 votes) defeated her nearest rival Amiya Mehta, winning the post of president. Urvashi bagged the post of vice-president and Anupreet Sidhu of the secretary. Sazina Khan was chosen joint secretary. Sumita was elected president, Arshpreet vice-president, Deepak, secretary, Deepika Moar and Kirti joint secretaries. The class representatives were selected unanimously. Ishani Sood defeated Preeti Maan by 127 votes and grabbed the post of president. Sukhmani was elected vice-president, Apurva, secretary, and Manu Sharma joint secretary. Birender Singh (SOPU-SHDU-SDCU) was elected president by securing 652 votes. Akshdeep Kaur was elected vice-president and Ruchika Mandherwal, joint secretary. Eight students were chosen class representatives. 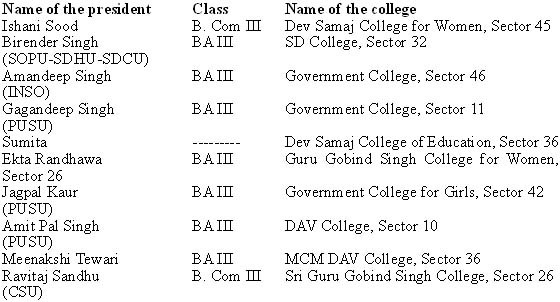 PUSU had a clean sweep at this college and won all posts backed by its nominees. Gagandeep Singh won the post of president by securing 1201 votes. Parminder was elected vice-president (1130 votes), Khushwant Singh, secretary (1296 votes) and Rajat Ghabru, joint secretary (1282 votes). Department and class representatives were also chosen. Jagpal Kaur bagged the president’s post and Amita Singh the vice-president’s post. Apoorva Sharma was chosen as secretary and Sandeep Kaur was selected as joint secretary. Complete lawlessness prevailed in city colleges and on roads on the election day today as group clashes, road rage, driving without helmet, cars with tinted glasses, and open jeeps packed with rowdy students remained the order of the day. 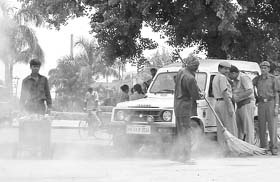 Though senior officers of the Chandigarh Police kept insisting that no major incidence of violence had been reported to the police from any part of the city till late in the evening, sources in the headquarters admitted that at least six students from different colleges sustained minor injuries in group clashes. The sources said arguments between rival groups led to a quarrel outside DAV College, Sector 10. Even though baton-yielding policemen tried to disperse the mob, rival groups managed to clash. As a result, at least four supporters were left nursing bruises. The reason behind the clash could not be ascertained as the two warring sides disappeared from the scene even before the police could initiate action against them. Efforts to elicit information from the eyewitnesses proved futile as they refused to comment on the incident. Even an hour after the clash, visitors to the college campus could feel the underlying tension as students huddled together kept away from the canteen and parking lot, apprehending another bout. The situation was hardly different in Sri Guru Gobind Singh College, Sector 26. At least two students sustained injuries in a clash in front of the institute. Here also, the provocation behind the occurrence of attack could not be ascertained. The sources said some of the injured were taken to hospitals, but were discharged after the administration of first aid. In almost all cases, the disputes were resolved on the spot in an amicable manner by the two sides, leaving little scope for police intervention, the sources said. Giving details of the incidents, the sources said most of the clashes occurred in the afternoon after the process of casting of ballot was over. At that time, a majority of policemen, on feet since morning, had run out of steam. Even though the Chandigarh Police had stepped up vigil on the “geri route” following its proximity to college campuses in Sector 10 and 11, just a handful of policemen could be seen on the road around 1 pm. Taking advantage of this, a number of students took to the streets on bikes without wearing helmets or on cars with tinted glasses. Others preferred modified jeeps. Party flags fluttered as they zipped down the road at breakneck speed, unchecked. Even though this year’s Panjab University Campus Students’ Council elections are being seen as first-ever “violence-free” elections, tension did prevail on the campus today. Tension flared up when supporters of the Student Organisation of Panjab University (SOPU) from SD College, Sector 32, came to the university campus for a victory lap after wining the college election. The incident occurred around 1 pm, when cars filled with SOPU came near the tent occupied by Panjab University Student Union (PUSU) students. PUSU activists objected to the presence of a college party on campus and asked them to leave. Things got out of hand when students from both parties started hurling abuses at one another. Some of the SOPU supporters even tore the shirts of PUSU supporters. PUSU supporters then kicked the doors of the cars and tried to pull SOPU supporters out of them. Police personnel present on the campus intervened and brought the situation under control. Tension prevailed for another half an hour as the police calmed PUSU supporters and asked SOPU supporters to leave the campus. Security was tightened and checking intensified at gate No.2 of the campus. Dalveer Singh (Goldy), presidential candidate for the Student Organisation of Panjab University (SOPU), in a statement today denied that a girl ever slapped him during his campaign for elections to Panjab University Campus Students’ Council. The elections were held today. He was referring to a report, “PUSU, SOPU supporters clash”, published in Chandigarh Tribune. The police has identified 11 persons, including Mr Dalbir Singh, a Congress councillor and close aide of the local MLA and Deputy Chief Minister, Mr Chander Mohan, as one of the accused in yesterday’s rioting here. The police has, however, not made any arrest. The police booked these persons yesterday, on charges of rioting, attempt to murder, criminal intimidation and assault, besides charges of causing damage to public property. The police has recognised them through the videography evidence, after the police had videographed the entire sequence of events. Police sources say that a report on yesterday’s event at Panchkula has also been submitted to the Director-General of Police, Mr Nirmal Singh. Yesterday, a group of over 500 persons, mainly from Mauli Jagran village in Chandigarh, had wreaked havoc on the roads of Panchkula in protest against the torching of houses of Dalits in Gohana. They burnt one bus, damaged three others, besides damaging scores of other government and private vehicles. Minor incidents of looting were also reported yesterday. The traces of yesterday’s arson were evident in Panchkula even today. The police was on high alert, stationed in areas adjoining the UT, and near the slim and labour colonies. Several reserves of police were stationed in pockets in various sectors, and patrolling was intensified. At Kalka, a group of Dalits gathered at Upper Mohalla early this morning. Police sources say that they were contemplating blocking the Kalka-Shimla National Highway, but the police and officers of civil administration reached there and diffused the tense situation. The members of the Dalit community finally agreed to lodge a protest with the Deputy Chief Minister, Mr Chander Mohan, when he visits here tomorrow. In wake of the torching of the Haryana Roadways buses by miscreants in various parts of Punjab, no buses from the Haryana Roadways buses went towards Punjab, except for in the adjoining pockets of Zirakpur and Dera Bassi. Meanwhile, Mr Gian Chand Gupta, state treasurer of the Haryana BJP, today demanded a high level probe into the alleged role of certain senior Congress leaders in sponsoring the arson and violence at Panchkula yesterday. “Because of the internal friction between factions of the Haryana Congress, some senior leaders were reportedly monitoring the entire sequence of violence and terror unleashed in the township. This has created fear among the residents. The role of these leaders should be investigated,” he demanded. A Chandigarh police constable, Manmohan Singh, died under mysterious circumstances at the police headquarters, Sector 9, this afternoon. Even though friends, family and colleagues expressed apprehensions about foul play, senior officers tried to pass it off as a mishap by saying Manmohan Singh had fallen off the fourth-floor balcony accidentally. The family and friends insisted that Manmohan Singh, deployed with the CIA staff since August 3, was being “targeted” because of internal differences over a recent seizure of liquor. Giving details, they said some members of the CIA staff were in favour of the accused in the liquor case. Manmohan Singh was being harassed because of his honest stand in the matter. Constable Manmohan Singh was an ardent kabaddi player and had won many medals. For promoting the game, he would organise a tournament at Kambali village in Mohali every year. They added that time and again 38-year-old Manmohan Singh had expressed apprehensions regarding his own safety. He had clearly told his friends that anything could happen to him because of the liquor issue. Details regarding threats issued to Manmohan Singh from time to time were reportedly forwarded to the police by his wife. Her statement was recorded by policemen late this evening. Disagreeing with the family, some police officers went up to the extent of suggesting that Manmohan Singh, suffering from acute depression following his mother’s death on August 29, had himself ended his life. In fact, he was in the headquarters for distributing the obituary cards an hour before the incident and had handed over the same to Inspectors J.S. Cheema and Kulwant Singh, besides other officers. In the process, Manmohan Singh, recruited in 1988, felt so bad that he took the extreme step at about 1.30 pm, the officers argued. Curiously, the police could not find even a single eyewitness to the incident, though the same took place right under their noses and at any given point of time scores of employees are present in the building. In the absence of eyewitnesses, the policemen could not even tell for certain whether Manmohan Singh had fallen from the fourth floor. A visit to the headquarters soon after the incident revealed that most of the policemen were in a state of shock. They were trying to maintain a deliberate silence over the issue. All they said was that Manmohan Singh was a “jolly good fellow”, besides being a tough and a daring cop. He was not the kind of a guy who would even think of ending his life. As the staff descended the stairs to reach the ground floor, they deliberately avoided the blood-stained spot. “It’s too much even for us,” said a colleague with tear-filled eyes. Sources in the headquarters said inquest proceedings under Section 174 of the Criminal Procedure Code had been initiated in the matter and the body would be sent for post-mortem on Sunday. Till the report was received, nothing could be said for certain, they added. A senior police officer said as of now they had not been able to lay their hands on any evidence that would suggest foul play. “If we come across anything incriminating, action will be initiated,” he declared. Back home in Burail village, Manmohan Singh’s family was inconsolable as they tried to come to terms with the incident that would eventually change their lives. His son and daughter kept on staring at the long drawn faces of their mother and other relatives trying to fathom the depth of the tragedy. As the news about the incident reached the neighbours, they gathered at the house to express solidarity with the family. The apple season has left the Chandigarh Police worried! Statistics show that the number of fatal accidents involving trucks go up by almost 100 per cent every year in the season as heavy vehicles carrying apples come down from different places in Himachal Pradesh, including Shimla and Kulu. Sources in the police headquarters assert that some of these trucks, in a hurry to reach their destination, ram into pedestrians, two-wheelers, auto-rickshaws and other vehicles year after year on the busy Madhya Marg culminating into the Chandigarh-Panchkula highway, besides the Dakshan Marg. In fact on an average seven fatal accidents involving trucks occur every month between August and October as against four in the other months. The sources add that a majority of the trucks involved in the collisions are on their way to the national Capital and other places, including parts of Punjab, after shedding part of their load in the Sector 26 grain market. Taking a serious view of the mishaps, the Chandigarh Police has decided to launch special drives for checking traffic rule violations by the truck drivers. For the purpose, the men-in-white are working out the modalities for setting up special nakas on the stretch in front of the grain market and other sensitive places. A high-level meeting in this regard was held recently. Giving details of the mishaps involving trucks, the sources assert that the vehicles were involved in as many as 61 fatal accidents in 2004 and the previous year. Elaborating upon the figures, the sources add that one-fourth of the accidents involving trucks took place on the Chandigarh-Panchkula highway, while 14 per cent of the mishaps occurred on the Ambala highway or the Dakshan Marg. As many as 12 per cent accidents took place on the Purv Marg. The statistics are the same for the Vikas Marg and the Industrial Area Phase I. After studying the data, a senior officer of the Chandigarh Police says that 75 per cent of the accidents involving trucks occurred on the four main roads cutting through the length and breadth of the city, besides the Industrial Area. The rest of the city was largely unaffected by the malady as it is out of bounds for trucks from 7am to 9 pm. As far as the victims are concerned, the officer says that 15 per cent are pedestrians. As many as 50 per cent are two-wheeler riders. Out of them, half are cyclists. Cycle-rickshaw pullers and passengers are also included in the list of victims. Truck loads of apples do not keep the doctors away. Analysing the data of the past two years, senior Chandigarh Police officers assert that on an average four fatal accidents involving trucks occurred each in November, January and February, while five each occurred in March and April. On August 6, September 7 and October 8 fatal accidents were, on an average, reported to the police. Bahadur Singh, two times Olympian and gold medalist of Asian Games at Busan in 2002. What are the reasons behind the decline of sports in India? The main reason is inadequate infrastructure and poor facilities at grass-root level. These days sports has become a time pass for sportspersons as their only aim is to get the job through it instead of achieving top honours for the country. Being Olympian, what do you suggest for its improvement? The government should focus on the overall improvement of essential sports infrastructure at the school level. System should be developed to promote sports culture in the villages as the villagers are stronger in built than the city people. So these people can make a mark in sports if the proper guidance and facilities are provided to them. Do you agree with the opinion that the sports’ training should be handed over to the Army? The idea seems good but I am afraid that the strict attitude of the Army may have adverse affects on sports as well as on sportspersons. Over one month after the MCC approved the introduction of the city pass for the parking of four-wheelers and the two-wheelers, the civic body is dragging its feet on the issue, putting the general public to inconvenience. In fact, the ambitious proposal, which formed part of the agenda of the MCC on August 29, was deferred in the wake of the study tour of the nine councillors, led by the Mayor, Ms Anu Chatrath, to Mumbai and Goa. The House of the MCC was to take a final decision on the city pass and its introduction in the current paid parking contract. At its meeting held on July 29, the MCC had fixed the pass charges at Rs 300 per month for the cars and Rs 150 for the scooters. However, the paid parking contractors opposed the civic body decision saying that rates were “too less” and they could not “afford” the introduction of the city pass. At the insistence of the MCC officials, a meeting of the contractors was held on August 9 and it was decided to revise the rates of the pass. Ultimately, Rs 500 and Rs 250 was finalised for the cars and scooters, respectively, and it was decided to implement the decision for a period of two months on an “experimental basis”, sources said. And with a view to bring down the charges of pass for scooter, a meeting was again held with contractors on August 18.The rate for the two-wheelers were slashed to Rs 150 per month. “The city pass shall be issued by the MCC at a charge of Rs 500 per month for four-wheelers and Rs 150 per month for two-wheelers. These city passes shall be issued between first and 10th of every month. Money so collected shall be divided among the contractors on a pro rata basis,” the resolution at the August 29 meeting said. Before the resolution could come up for discussion, the meeting ended abruptly. Now, the decision could only be implemented by next month after approval at this month’s general house meeting of the civic body, an official added. The sparks of the Gohana incident ignited a row in Sector 25 here late this evening. After assuming that electricity supply to Janata Colony had been suspended as several Dalits were living in the area, agitated colony dwellers stoned and damaged over four vehicles, besides allegedly manhandling several commuters. The damaged vehicles included a state-owned truck, besides cars. They also blocked the road in front of the Batra Theatre, disrupting normal flow of traffic for almost an hour. The issue was resolved only after senior police officers reached the spot and pacified the angry crowd. They were told that disruption in power supply had nothing to do with the presence of Dalits in the colony. The same was due to a fault in the power supply lines and had since been rectified. The sources in the local police said soon after power failure in the evening, some miscreants started spreading rumours that the administration had made a deliberate attempt to keep the Dalits in the dark, leading to resentment among the masses. A senior officer, when contacted, said the situation was back to normal and there was nothing to worry. “In any case, we have deployed additional staff in the area to avoid the occurrence of any untoward incident,” he said. Dr Kidwai maintained that, “They may be a minority, but they are a minority equipped with intellectual powers and can make their mark in any part of society.” He also said Indian culture was incomplete without them and they still played a vital role in the fabric of the country. He concluded his talk by once again acknowledging that not enough had been done for the rehabilitation and care of the community. “I am sorry we could not do better to look after your interest owning to the circumstances,” but promised to look into any matter that the All India Kashmiri Samaj, brought to his notice. He also listed the problems that the community was facing vis-à-vis the construction of the Kashmir Bhavan at Panchkula, the decision on which is pending for five years; the registration of Kashmiri Pandits, which is not happening in Haryana; the heavy amount being levied as development charges on land purchased by Kashmiri Pandits at Bahadurgarh since the land falls under ‘developed land’ with HUDA and the relief money which Punjab raised to Rs 2,000 per month for the refugees but Haryana has still not done that. Mr Vipin Pubby, Resident Editor, Indian Express, also spoke on the occasion. Ayan Bhattacharya started work today. 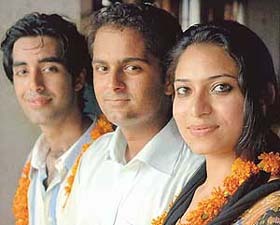 For, this 24-year-old donor brother who came all the way from Assam with his brother and sister-in-law Sujit and Reema, life’s snags seemed to have eased off just a little, with a job in hand. Sujit, Reema and Ayan Bhattacharya’s plight was highlighted by The Tribune on September 2. Today was Ayan’s first day at work at the “Glass Palace” office depot in Sector 7. Marketing Godrej products and overseeing the work at the outlet is what Ayan starts with primarily and is being paid Rs. 2200 per month. A commerce graduate from Silchar in Assam, Ayan is bewildered at how fast everything has moved. Although he is not allowed to exert himself either, he is firm about working now that the opportunity has presented itself. Sujit is not allowed to move at all for the next three or four months and his wife will have to take care of his every need since he is more or less bed-ridden. They both plan to look for a job just as soon as they can. In the meantime, they have received a little assistance in the form of donations. In three days, two Americans John Silliphant and Mark Peters, covering Chandigarh on bicycles, brought their message of ‘Friendship without Borders’ to over one lakh people in the city. Guided by the volunteers of peace and environmental NGO Yuvsatta, the peace makers from the USA covered a dozen schools, spoke with 20,000 students and received about 7,000 cards, poems and letters, all carrying messages of peace, love and friendship for Pakistani neighbours. These cards, the American friends will present to students in Pakistan when they cross the border shortly. Acting on the complaint of a local human rights activist, the Punjab State Human Rights Commission (PSHRC) has ordered an inquiry into the functioning of the Central Jail (Women), Ludhiana. A Division Bench of the commission comprising Mr NK Arora and Mr BC Rajput, both Members, has directed the DGP (Prisons) to submit a report under Sections 17(i) of the Protection of Human Rights Act, 1993, by November 25, the next date of hearing. It was alleged in the application that the functioning of jail left much to be desired with the result that the inmates were at the receiving end. No permanent doctor was posted in the jail, virtually depriving the inmates of medical assistance. Moreover, there was no telephone facility and in case of any emergency no help could be called inside the jail premises. Substandard food was served to the women inmates exposing them to health hazards. It was also alleged that the jail was overcrowded and the building was in a bad condition. It may be recalled the matter was highlighted in these columns recently following which Mr Rajput had made a surprise check of the jail. A gunman posted with the Deputy Commissioner, died of a suspected cardiac arrest this afternoon. The 38-year-old victim, Kashmiri Lal, reported sick in the morning and went to the General Hospital, Sector 6, here for a check-up. But before the doctors could examine him, he is suspected to have suffered a cardiac arrest and died. Police sources say that he had first gone to get his salary withdrawn from the Police Lines. He went back to the DC office, where he complained of uneasiness. He himself drove his scooter to the hospital for a check-up, and walked into the Emergency. “He even explained his uneasiness, but before we could examine him, he died,” informed the doctors on duty at the hospital. The Deputy Commissioner, Mr Brijendra Singh, and the Superintendent of Police, Mr Balbir Singh, rushed to the hospital on getting the news about his death. The victim, who belongs to Kurukshetra, is survived by his wife and two children. His family was also informed about his death. SUICIDE: Mystery shrouds the death of a 32- year-old woman from Zirakpur, who died of suspected poisoning on Saturday. The victim, Meenakshi, was admitted to a private hospital in Panchkula on Friday night. Rehriwallas today organised a protest outside the office of the SP in Phase IV here against police orders banning their entry on the internal roads of the town. The protesters demanded that the police should withdraw the ban orders as they were now unable to feed their families. They said they sold vegetables, fruits and other items to earn their livelihood by moving about in the residential areas but the ban had made their life miserable. The police had imposed the ban to check crime in the town. However, the SP was not in his office at the time of the protest. Vendors had to then meet the DSP, Mr Harpreet Singh. They asked the DSP to help them in the matter. They said the police could issue them identity cards after carrying out a verification. The protest was organised under the leadership of Ms Pushpa Salaria, president of the Dalit Rights Protection Forum, Punjab. She said the order passed by the police was arbitrary, illegal and unreasonable and should be withdrawn immediately. Members of the Bhairon Ki Sair village panchayat today met the Superintendent of Police, Mr Balbir Singh, and urged him to take action against a fellow villager, who they claimed was indulging in various criminal activities. Mr Amar Nath, Sarpanch of the village, alleged that Ved Prakash had been declared a proclaimed offender in Chittorgarh, Rajasthan. “He has been booked earlier on charges of assault, intimidation, and for breach of peace here. But he continues to create trouble in the village,” he said. The panchayat members said though they had made numerous requests to the police, no action was being taken against Ved. They demanded that action be taken against him. A sergeant with the Air Force ended his life this afternoon by hanging himself from a tree in the ground behind 3-Base Repair Depot (BRD) in Sector 47. The deceased has been identified as 32-year-old Srinivasan. The Air Force authorities have been informed about the incident. Through senior officers of the Chandigarh Police were tight lipped about the incident, the sources in the police headquarters said suffocation at work could have led to the extreme step. They added that the matter was being probed. The police arrested Aman Rair, resident of Sector 61, from near the Neelam theatre parking on the charges of snatching a mobile phone here yesterday. The police said Aman snatched the mobile phone from Rashmi Limbu of Sector 15, Chandigarh, from near Hotel Taj in Sector 17 on July 18. A case had been registered. Liquor seized: The police seized 47 bottles of liquor from a Maruti car (CH-01-H-4167) parked behind shops in Sector 20 late last night. At least two persons were injured in a clash over a piece of land at Mohali village here today. The clash reportedly took place near an STD booth in village. Car-borne persons arrived and tried to take possession of a piece of land near the booth claiming that they had purchased it. This was resisted by a Nihang leading to the clash in which swords were allegedly used.